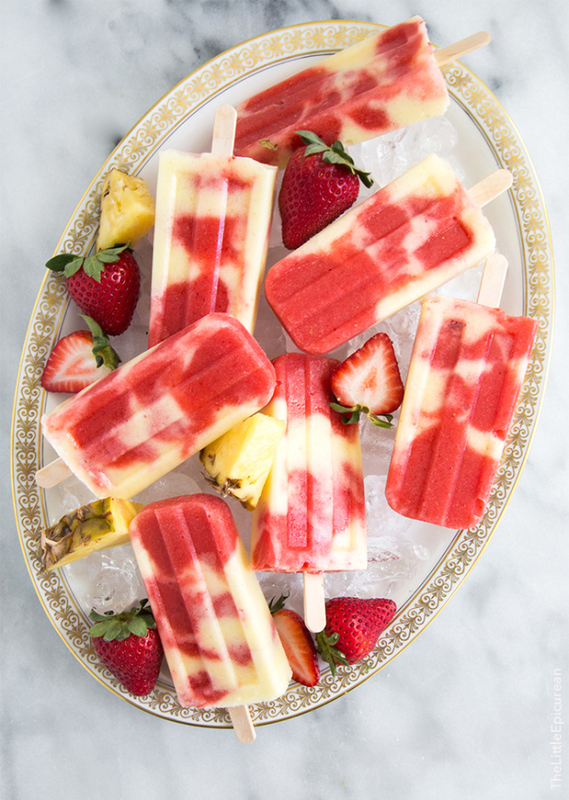 These lava flow popsicles are like a vacation on stick! The combination of coconut, pineapple, and strawberry is sure to relax you and make you think of a tropical paradise. I got a major dose of summer this weekend. Unable to wait any longer, I’m bringing summer early to my blog. My friends and I trekked on over to Indio for our annual Coachella Music Festival trip. (Last year, I made a little Coachella recap if you want to check it out!) Three carefree, leisurely days under the sun listening to awesome music will definitely make you crave summertime. I don’t know about you, but I have summer vacation constantly on my mind. If I’m not thinking about food, I’m thinking of travel plans (and the food I’ll be eating on vacation). I had so much fun in Maui and Kauai with my family last summer that I’m itching to visit Hawaii again this year. 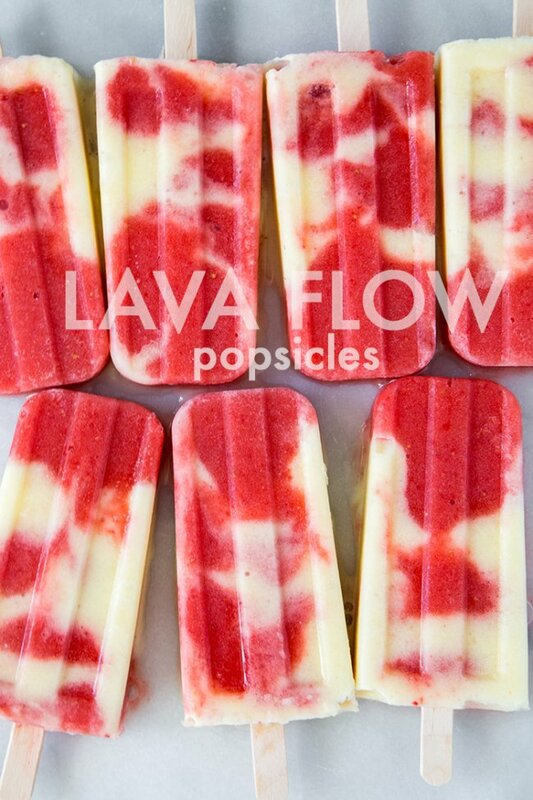 In hopes that I’ll be able to island hop again this summer, I bring you lava flow popsicles! Lava flow is such a cool looking cocktail. Aptly named, the cocktail is supposed to look like molten lava flowing down a charred volcano. While flowing lava is some 2,000°F, these lava flow popsicles are frozen and will definitely cool you down on a hot summer afternoon. 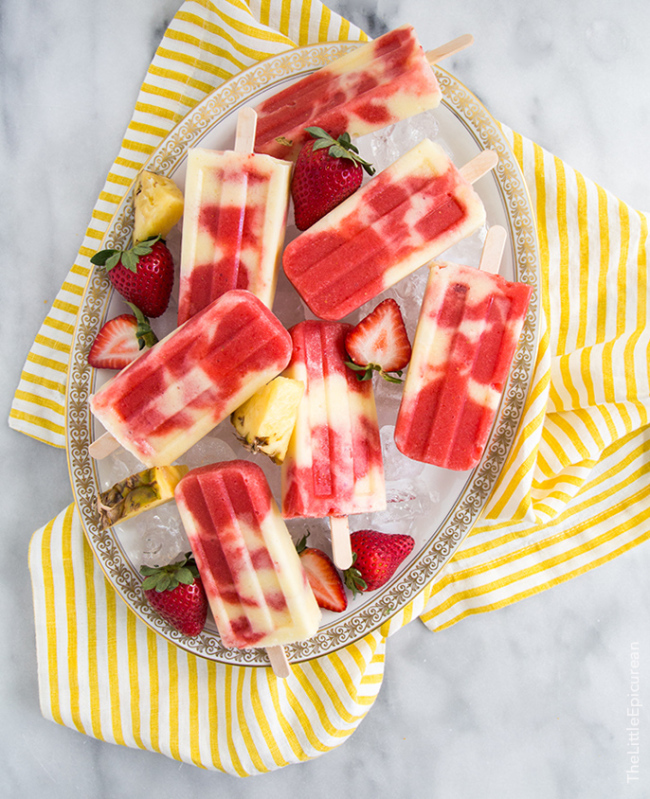 These lava flow pops are like a “vacation on a stick!” The delightful swirl of coconut, pineapple, and strawberry can make me almost feel the tropical breeze and the sunshine of the beach. I find the combination of these flavors so refreshing and relaxing, just like the way you’re supposed to feel while on vacay. I made two versions of these popsicles: a boozy one for fun times and a fruity non-alcoholic one you can enjoy for breakfast. Simply omit the alcohol in the recipe to make the virgin version. Since alcohol does not completely freeze, the boozy popsicles may be a little icy. The consistency of the boozy pops depends on the amount of alcohol use. In a blender, combine pineapple, pineapple juice, and coconut milk until smooth. Pour into a large measuring cup with spout. Clean out blender. Add strawberries and apple juice. Blend until smooth. Pour into a large measuring cup with spout. Fill popsicle mold 1/3 full of strawberry mixture. Slowly pour in a little bit of the pineapple coconut mixture. Follow with a splash of strawberry mixture and then top with pineapple coconut mixture. Because the coconut mixture is more dense than the strawberry, it will displace some of the strawberry creating that desired swirled effect. Place a layer of foil over the popsicle molds. Insert wooden sticks into the mold. Place in freezer for at least 3 hour until the popsicles are solid. The pineapple juice and apple juice I used provided enough sweetness to my fruits. If you want it sweeter, add simple syrup or agave syrup to taste. Alcohol does not freeze completely. If you choose to make boozy popsicles, the popsicles will be a little icy depending on the amount of alcohol used. Plain vodka also works. I used Ciroc Coconut Vodka. You can use any white rum, including coconut rum. Don't use dark, aged rum because you won't get that nice rich red color. I used these popsicle molds. These popsicles are gorgeous, Maryanne! Loving all the warm summer flavors! Delicious, and cool looking. I want more of these! Holy yum! These lava pops are super pretty! Also – SO JEALOUS you might get to go back to Hawaii this summer – can I come in your suitcase?? I’m with you! 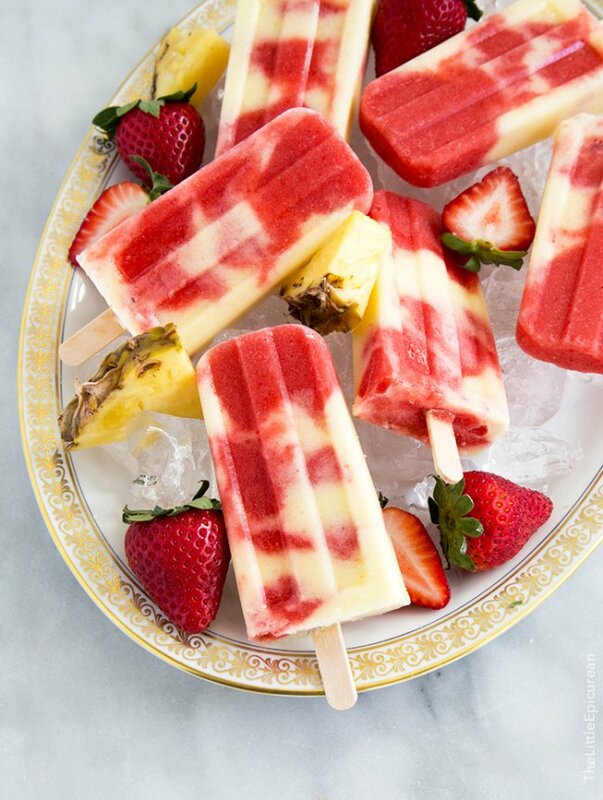 Bring on Summer and these look delish! !